Fort Lee, N.J.- When Faith Assembly Church moved from their main campus in Orlando, Florida to a nearby significantly larger 300,000 square foot space, the organization had big plans of making their megachurch technically savvy on a tight budget. After two and a half years of construction, the first phase of the process is finished, and the church recently opened its doors for services. Included in the list of new equipment installed and key to the church's video production is a FOR-A HVS-350HS HD/SD 1.5 M/E Video Switcher, which is set in the video control room of the complex. The Encore Broadcast Solutions team, led by Jeff Cameron of the company's Winter Springs, FL, office, provided systems integration services on this large-scale project. Encore was tasked with design, sales, and installation of all audio, video, and lighting systems in the entire complex. "We put a lot of time and effort into determining the products that would best fit the church's needs," said Gadiel Marquez, Encore's systems design engineer. "We chose FOR-A's switcher because of the flexibility it offers. The HVS-350HS brings powerful production value, and has the ability to easily accommodate all of Faith Assembly's video production needs. Our experience with FOR-A equipment is that their products are extremely reliable and long lasting. We believe that with the HVS-350HS switcher, we've prepped Faith Assembly for a long future of dependable video production." Faith Assembly utilizes video in a variety of ways, including live streaming of church services to reach its audience in multiple continents, streaming of baptisms, concert production, and production of wedding ceremonies. The main campus includes six main venues, each with full audio, video, and lighting capabilities. They are: the main sanctuary, the wedding chapel, two theaters for children, an atrium and a dining hall. The entire complex is completely integrated, with HD/SDI capability from one location to the next and a common intercom channel that runs throughout the entire campus. To simplify the learning curve for the church's mix of paid employees and volunteer staff, all buildings on the property have the exact same video package. "We did this to allow our personnel to familiarize themselves with the technology in one control room, then walk into another venue and have the exact same setup to deal with," said Robb Hawks, Faith Assembly's Executive Pastor. "We've made video production easier in other ways too. All of the equipment in our dining hall is on rolling racks, so that we can easily transport the gear to another room if needed. The ability to quickly move production equipment from one venue to the next is particularly handy as we move forward with our next phase of construction in different areas of the complex." The 2,700-seat auditorium in the main sanctuary features a multi-screen configuration, including a 60-foot wide main center screen and DPI Quad Projectors. Faith Assembly selected Hitachi HD cameras, which they felt offered excellent high definition quality with a reasonable price tag. The cameras are equipped with Angenieux lenses and are set in the sound booth in the back of the auditorium. The church is also equipped with Turbo Sound speakers. In all of the design criterion within the new Faith Assembly campus, there is a strict attention to detail. For example, to streamline the process of checking people into the church for various activities, an automated system was installed to quickly sign family members into different venues. A 9x16 LED jumbo screen video wall was purchased from the Orlando Magic NBA team to provide digital signage in the church's bookstore. Three of the venues have robotic camera systems, including the wedding chapel, which was custom built to switch wedding ceremonies live, then quickly render a DVD for viewing during the reception. The church looked for ways to cut costs in the long term, in addition to selecting cost-effective equipment. Faith Assembly purchased LED light fixtures for use on the main floor of their sanctuary, which cut their electrical use down by 75 percent. With this lighting, the church continually saves money on both electricity and air conditioning, since the lighting fixtures use only a fraction of the heat as typical lighting solutions. "So much time and effort was put into this project and in working with Encore, we were able to put together a very open infrastructure with a lot of flexibility," said Hawks. "We're extremely pleased with the level of sophistication we've been able to achieve technically and within our budget. 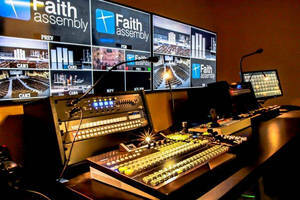 Using FOR-A's video switcher has greatly contributed to our success, and Faith Assembly is confident that our efficient video production setup will help us thrive as an organization." FOR-A is a major manufacturer and distributor of video and audio systems to the broadcast, postproduction and professional video markets. For more information about FOR-A's product line, call 201-944-1120 or visit our web site at www.for-a.com.